Australia’s Prime Minister Tony Abbott has been accused of bullying and asked why he keeps saying “stupid things,” during a live radio interview. Before that, he compared the opposition leader to one of the most notorious Nazi leaders, Joseph Goebbels. 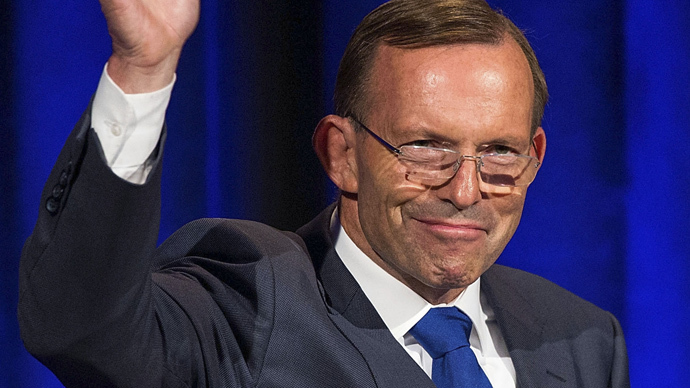 "Mr. Abbott, for a Rhodes scholar, how come you say so many stupid things?” a host on Melbourne’s 774 ABC, Jon Faine, asked Tony Abbott on air Friday. “[Your comment on] ‘Lifestyle choices’ has enraged Aboriginal community leaders, and yesterday, bringing Goebbels into the parliament?" Two Jewish Labour MPs left the chamber over the remark. Abbott was quick to withdraw his words, but the damage was done. “I accept that in the context of history and the way things have developed that was an over-the-top remark and I straight away withdrew and apologized," he said on the radio. It is not the first time Abbott has resorted to a dubious analogy in a political dispute. Just a month ago he accused the Labor Party of having caused "a holocaust of job losses," when it was in power. Last week, he drew an avalanche of criticism for saying that the government could not “endlessly subsidize lifestyle choices” of aboriginal people living in remote communities. Ghillar Michael Anderson, an aboriginal leader and activist who spoke to RT, said he was not surprised at the comment. “Tony Abbott, he’s become a joke in Australian politics,” Anderson said. “There’s all sorts of little cartoons about Tony Abbott in this country. I got no idea how he got elected by his party to lead the party”. Faine was tough on the country’s leader. "But why do you have this ‘foot-in-mouth’ disease? What's going on?" he asked. Among the PM’s most recent gaffes was a well-wishing St. Patrick’s Day video message, which the Irish did not particularly like, accusing him of promoting the perception that Ireland is synonymous with alcoholism. In October last year, Abbott promised to “shirtfront” Russian President Vladimir Putin at November’s APEC summit in Beijing, for what he believed was Russia’s perceived role in the downing of Malaysia Airlines Flight MH17 over southeast Ukraine, which killed 27 Australian citizens. Rather than getting to ‘grips’ with Putin in Beijing, Abbott opted for a joint photo at the G20 Summit in Brisbane with cuddling koalas, for which he was massively ridiculed on social media.